a few quiet minutes to myself while the guests and the child and the husband all make a little trip out to the tarzan cliff--a nearby beach that sabin adores. i'm home, watching over the beautiful garlic-studded organic leg of lamb. i couldn't really leave it behind on its own, now could i? plus, there's bread to be made and lemons to be squeezed so they have fresh lemonade when they come back. but, right now, i have a few minutes to relax and reflect on the past days of easter holiday. it's really been glorious.it helped that the weather was exemplary and it also helped that we went down to møn's klint. we spent time with friends, playing cards and we got the garden and the greenhouse ready for the season. we ate lunch outside. we stayed up late watching monty python movies. we went for a walk and an ice cream at a little castle nearby. in all, it's been completely relaxing and wonderful. i was thinking that it made me sad it was ending, but it really doesn't, because i feel renewed and recharged and ready to jump into being busy with a dozen articles for the first issue of the magazine i'm editing (and writing). and i thought i'd update my "evidence of creativity" and share the things i had the chance to make on thursday and friday, two luxurious days where i never got dressed in proper clothes and just worked in my studio. these and a few others will go up in my etsy shop this week. Oh, how lovely. I'm sure some of the fabric is Anna Maria Horner. I love her fabric. 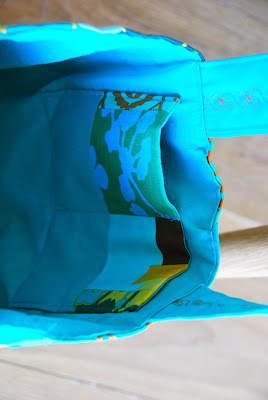 I'm having some porch swing cushions made right now, so I'll post on my blog probably next week. I can't wait to sit on them and read a book or twitter or something. Anyway, I love your painted rocks. So lovely. Loving the first one. I am glad you had a wonderful Easter! it's true, the fabrics are all anna maria horner, except the plain blue, it's just an ordinary cotton from my local fabric store. I never thought to put a warmer around the French press! Ours always gets cold and I am not a cold coffee drinker. Love to be there for the dinner...lots of garlis on lamb..yum! Beautiful stones! 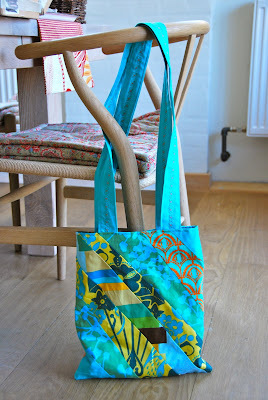 And a very lovely bag! Glad you had such a lovely-sounding weekend, and good luck for the busy week ahead. You must be ready for anything this coming week after that wonderful recharge. Your projects are wonderful and wonderful you created them in an unhurried way...have a great week! sounds like a lovely time and you are so very creative. I really love that last rock. I knew I should have come over for the slushy and stayed for the flow of creativity! Need it. Although bought stuff for my give away - jewlery supplies to make some "Jules"
I adore the French Press coat, the colors, the heart clasps, the whole thing is so wonderful! 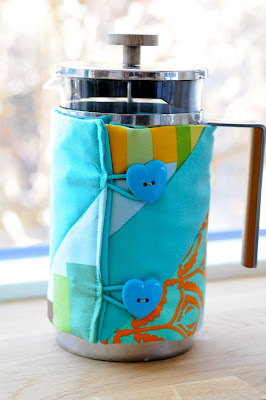 I just love the french press warmer and the spring bag is lovely too. The warmer is such a great idea to keep the coffee warm. I can't believe how creative one girl can be...do you have ideas swirling around in your head all day long? Ho do you manage to work as well? A coffee cozy! They have been made for the tea pot, why NOT the coffee pot. Great idea!